I’m loving the photo collection I recently discovered by noted travel photographer Steve McCurry (a 30-year veteran in the industry) entitled “Trains,” his ode to India’s beloved and ubiquitous mode of transportation. From the sweeping long shots (like the one from Agra above), to the intimate close-ups, McCurry’s overarching theme is his amazing ability to tell an immense story and elicit a sense of wonder through his images. 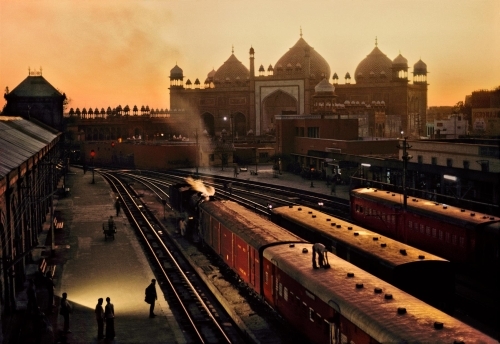 On his site, McCurry describes why he chose trains to tell his story of India. Ever since the British built the railroads in India that stitch that vast subcontinent together, trains have been the organizing force that unify all of its disparate parts. As I tried to tell the story of the community that inhabits the depots, I would go to the train station every day and wander around the platform. Each time a train would roll in, while carefully stepping over bodies and around huge mountains of luggage, I would start to photograph the swirl of life that assaults and saturates the senses. To see the entire “Trains” set as well as his full portfolio, visit Steve McCurry’s site here.